October officially marks the start of soup season. Eating a big, steaming bowl of soup just feels right when it’s cold outside. Don’t get me wrong, I won’t turn down a bowl of soup in the summer, but doesn’t it seem to taste better when it’s cold outside? Eh, maybe it’s just me. This week, the #SundaySupper team is busting out their slow cookers. This slow cooker kielbasa soup with kale and white beans is going to take you straight to flavor town. The ingredient list may appear simple, but, I promise you, this soup isn’t lacking when it comes to flavor. It’s all about the kielbasa. I use three links of Polish kielbasa in this soup. Not only is the soup meaty and hearty, but the broth is rich and savory. The depth of flavor is all thanks to the kielbasa. So, don’t be fooled by the simple list of ingredients, because this soup packs a meaty punch. In addition to the kielbasa, I added 5 cups of kale. 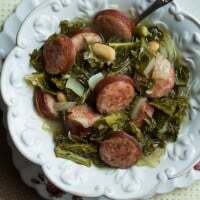 The smoky flavor from the kielbasa pairs perfectly with the the bitter kale. It may look like a lot of kale at first, but once the mixture starts to get warm and heat up, the kale will wilt right into the broth. Let’s not forget about the white beans. I used two cans of cannellini beans that I drained and rinsed before adding them to the bowl of the slow cooker. The beans add a creamy burst with every spoonful. After everything is made and devoured, you only have one dish to clean. Really, it’s not a bad deal. Slow-cooked soup made with hearty chunks of Polish kielbasa, kale, and creamy cannellini beans. Place all of the ingredients in the bowl of your slow cooker. Stir to combine. It will appear as if there is too much kale in the bowl. As it cooks, the kale will wilt into the soup. Cook on low for 7 hours. Season with salt and pepper to taste. Oh yes, it is definitely all about the kielbasa. I’m thinking I’d like to make it with turnip greens too. Yummy! Turnip greens would be splendid in this soup. Thanks, Renee! Thank you so much, Lea Ann! Oh, yeah! I love adding sausage to my soups! You’ve hit a home run with this recipe!!! It adds a wonderful smoky flavor to the dish. Thanks, Liz! I love finding new ways to use kale and the addition of kielbasa makes this a winner. Yum! What an interesting combination of flavors. I bet my husband would love this recipe! It’s total man food. My husband loves this soup, and it’s probably due to the fact that it’s full of kielbasa. I’ve been making soup like a crazy woman lately! haha I just can’t get enough! This sounds delicious – and even better that it’s in the crockpot! I can’t get enough of it lately. Any soup that I don’t have to stir for 3 hours is a winner. Lovely looking looking, love the kale and kielbasa combo!! It’s hearty enough to be stew, Uru. Thank you so much! Love this hearty kale soup! Your photography is gorgeous, too!! Jennie, thought it was escarole at first, but kale is perfect to stand up to seven hours in the cooker. I’ll be trying this recipe; simple, hearty and looks delicious! Kale loves the slow cooker. Thank you so much, Isabel! Kielbasa season is officially here! I think this is a dish that would get me to like kale! I think you’re probably right, Sarah. In this soup, the kale takes on the flavor of the kielbasa. 4 years later and I’m still loving this soup! I make it a couple of times each year and always get requests for the recipe.